Here are a few little "spoilers"...new flavored bath bombes, that have been a hit!! Everyone loves them for the reason that I do...they make your kids take a bath, and they smell soo good for the rest of the day! 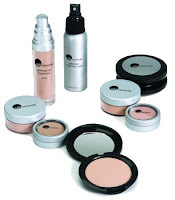 Hmmm, I think very very soon, we will be offering make up application, we have chosen Glow mineral make up, it is the best mineral make up out there, it is triple milled and contains plenty of antioxidants for the health of your skin! Remember the post I made about..."and then there were three". Well, well well, that is old news! We now have 5, 6 and possibly 7!! After Michele, came Connie, who is very excellent at pedicures and manicures and can put you to sleep and heal all your problems with an hour long reflexology treatment. Connie can also tell you so much valuable information about Young Living Pure Essential Oils, and let me tell you, you won't be able to live without them! Connie will only be with us for the summer and into early fall, so many people already have had reflexology treatments on Monday, when it's nice and quiet, treat yourself you won't be sorry! She is also offering Aqua Chi foot bath sessions, click on that word and you can read a bit about it! It is very interesting indeed! Coming soon will be Courtney, she is coming to us from Best & Company in Syracuse and we are very excited for her to join our team!! Keep checking back for more info on Courtney, she will bring alot of talent and enthusiasm to our team! She will be offering make up applications with the Glo mineral make up line as well!! Thank you and have a wonderful start to this glorious summer! !